“I wanted a job that would pay me well. But more importantly there needed to be some ‘prestige’ attached to it.” says 20 year-old Sathish. His father Pothalu has worked as a pourakarmika for the last 27 years. 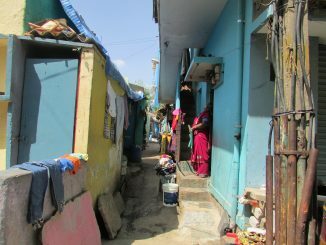 Sathish grew up watching his father sweeping the streets of Basavangudi. There are countless like Sathish, who come from underprivileged backgrounds, looking for jobs. These youngsters’ ambitions face a lot of hurdles – limited opportunities, access to quality education and financial challenges in their homes. Most of their parents work in the informal sector which is still the largest employment provider in the country, with no access to benefits and social security; they are rarely even accorded dignity for their work. Their children are now out in the world looking to join the workforce as newly minted high school or college graduates. How does their lack of privilege translate into reality for them? As social animals, wanting a better life for ourselves and our children is a very innate trait. Our need for this upward mobility in society therefore becomes an important sociological force that needs governments to get imaginative in job creation. While the demographic in white collar jobs have social capital — well placed friends and an influential social network that can help provide leads for opportunities for their children, what happens to the youngsters whose parents are blue and grey-collared employees? With limited or low education, their opportunities too are finite. So how does a better life get defined for them? “Most of them don’t have a clue of what they want to do when they come to us. (For them) It isn’t about becoming doctors or engineers. Their priority is to find a job that pays them well, but (one that denotes) a better position than their parents.” says Ramesh Swamy, CEO and Director of Unnati, an NGO that conducts skill development programmes and organises placements for youngsters from underprivileged backgrounds. Most of their parents work as domestic help, cooks, gardeners, nannies – all of whom are an integral part of many middle class lives. But the next generation do not want to follow in their footsteps. It isn’t about ‘having a career’ for many of them. It is about getting a job that pays well. “A lack of imagination is what limits their opportunities, but that is also because they do not approach it with a (long term) plan of perhaps five years. We with our middle class hats invest at least five years in our 18-year-old child’s future. These guys don’t.” says Gayathri Vasudevan. Gayathri is the CEO of Labournet.in that works in the space of education, employment and entrepreneurship in the informal sector. With a different set of criteria for a job, their search parameters therefore don’t lend themselves to long term planning for a career. It does however acknowledge their everyday reality. Sathish’s focus on a job that brings ‘prestige’ is not surprising. His father Pothalu, in addition to his day job as a pourakarmika, also cleaned drains, washed cars, and did odd jobs like gardening, to supplement his income to fend for his large family with seven children. “But even after 20 odd years, the people who need his services treat him with no dignity,” says the youngster. After his SSLC, Sathish started to work as a sales boy in a local fabric shop. Three years later, he now works as a sales executive in a retail chain, even getting healthcare benefits in addition to his salary. His father could not be happier. “He doesn’t have to travel too far and there is some security to his job.” says Pothalu. So what do they look for? “Well most people who come here want a government job. But those who opt for private jobs meanwhile also have a list of demands. Most of them don’t want high pressure jobs like sales which are target- based. They don’t want menial jobs like housekeeping and cleaning jobs. They are also very insistent on jobs with companies who are well known. We have a skill development sessions and the employment fairs where they are placed. The highest attrition rate that we see are in sales and marketing jobs, despite the lower numbers who opt for it. They just don’t want to do it. This is especially true of second-generation Bangalorean kids,” says Sreenivas. Forced to be a single parent following a family feud, Lakshmi, a domestic worker is proud of her kids. Her daughter, Shanti is a B.Com graduate and works as an accounts assistant in a private company and is now pursuing a second graduate degree through an open university. Her son, Pratap completed a certification course after he came out of school and now works as a service executive at a home electronics company. “I was made to quit school in the 3rd grade and have no choice but to clean dirty vessels to survive. But my children don’t have to do that. They will have better lives than mine,” she breathes a sigh of relief. Her son Pratap works as a service executive for a private company in the home appliances sector. “I earn more than my manager does. My mother does point out that he has a cushy job of working from an office and doesn’t have to travel around the city in the traffic and a manager is a higher designation. But I prefer this right now, because the money is good” he says. There is one thing about the expectations among this crop of job-seekers that worries Ramesh of Unnati. “Most of these kids have watched their parents struggle with menial jobs, which they attribute to the fact that they were not literate. Since the children have some education under their belt, there is almost a sense of entitlement that they should be able to get jobs. But they are not willing to work very hard at them. They don’t want shift jobs. Most of them don’t want target-based jobs either. But most of them want jobs that pay a starting salary of at least Rs 15,000. Where will they find it? If this misconception doesn’t come down quickly, they are a spent force because with every year, a new batch of job seekers enters the market. Part of our counselling is aimed at introducing them to this market reality,” he says. So what is the market reality like for them? What are the expectations from an employer’s perspective? Domestic BPOs and data entry operator jobs demand computer skills and fair knowledge of English. Communications are part of most of the skill training sessions offered by many NGOs in the sector as the service industry grows. And it is the service industry that has given a boost to these job seekers. Various websites babajobs.com, aasanjobs.com and mobile apps like UrbanClap have thousands of jobs listed on them. Around 1207 vacancies pop up on BabaJobs for delivery boy vacancies, with promises of monthly salaries up to Rs 35,000. The domestic BPO sector has around 4187 vacancies. These B2C platforms have become important to bridge the gap between the service industry and job seekers, especially in the context of those workers transitioning from agriculture to the non-agricultural sector. “The rise of the retail sector of course has provided many jobs for this sector,” says Vir Kashyap, co-founder of Babajobs.com, one of the first online portals that attempted to systemise the way blue and grey collared jobs were recruited. The website which was bought by Quickr in 2017, had about 10 million job seekers registered with it at one point. “When we started in 2007, the first few thousand registrations were done on pen and paper and it was very unlikely that a small shop owner would browse the Internet looking for sales people. But our idea was to use technology as an equaliser of opportunities and we wanted to change the way people were being recruited for these jobs. So we extensively used sms and voice platforms in eight different languages to reach out. But the rise of the retail market created positions like delivery boys, sales executives etc. and enhanced employment opportunities for these job seekers. We also worked with focus groups for skill development to improve their chances at finding employment.” says Vir. Despite a steady rise in the market, the policy framework for the sector is still nascent. But most of these websites also seek to educate the job seekers on contracts and what they can negotiate for themselves based on the skill sets they bring to the table. The most recent report (July 2017) from the International Labour Organisation on the trends of India Labour Market also nods to this trend. The report says that the share of workers in the unorganised sector has come down, but share of informal workers in the organised sector has gone up. The most recent Economic Survey 2018 also put formal employment at 31% in the non agricultural workforce. If one were to use GST as the parameter, this number increases to 53%. However only 13% of the total companies that are categorised under the non-agricultural sector fall under the hard-core formal sector (being either under GST or providing social security for its employees). The rest of the 87% are largely outside this gambit and purely informal, with no social security benefits or perks. So many social welfare schemes for the poor, who benefits? The United Nations’ observes October 17th as the International Day for Eradication of Poverty with a goal to “end poverty in all its forms everywhere.” In Bengaluru, as in many other cities, there is no dearth of government welfare schemes for the poor. But do these schemes reach the poor in reality?